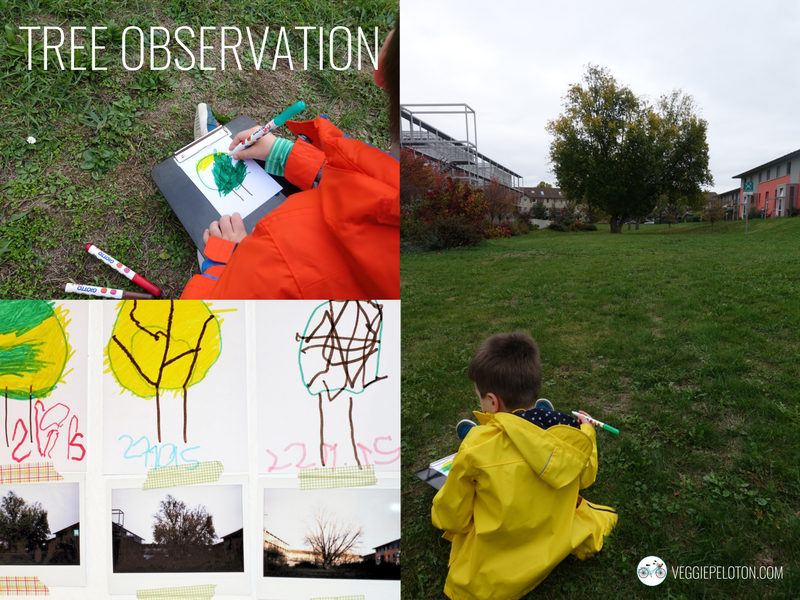 The excellent book Discovering nature with young children from The Young Scientist Series has finally made us do something we’ve been wanting to do for years: observe and document a tree in Autumn as the color of its leaves change until it has lost them all. Before leaving the house we would choose which markers we should take, having in mind the colors Gabriel thought the leaves would have. In order to document the changes, he made a drawing of the tree, focusing mostly on the leaves colors. Besides drawing it, we also took pictures with our digital camera and Gabriel also took pictures with an instant camera. The pictures were of very poor quality, but we though it was interesting for him to have another support besides the drawing. Once at home Gabriel wrote the date and taped both the picture and the drawing on a wall, one day after the other in order to see the evolution. We have agreed to keep tracking of the tree’s changes when Spring comes and the leaves with it!